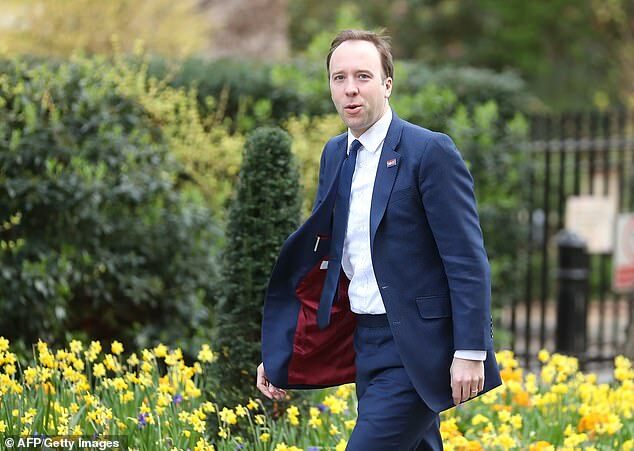 Social media giants must do more to crack down on ‘damaging’ anti-vaccination myths, Health Secretary Matt Hancock has said. 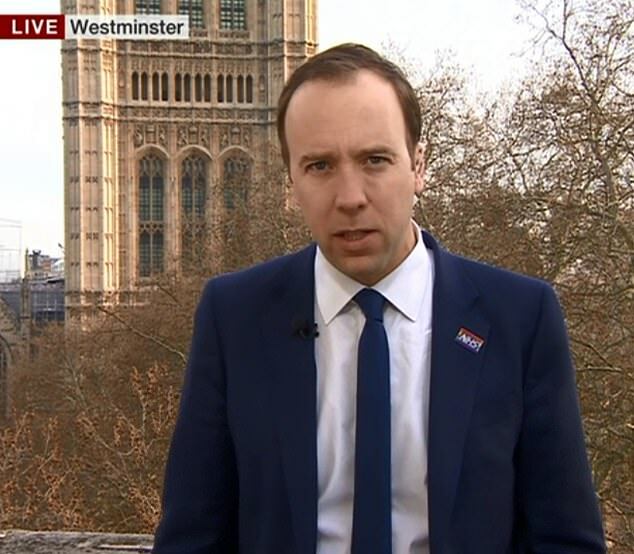 Speaking on BBC Breakfast, the cabinet minister even suggested spreading lies about vaccines online could become illegal. His comments come just days after Instagram announced it would block anti-vaxxer hashtags like #vaccinesarepoison to try and stop the spread of the opinions. And Facebook said earlier this month it would ban adverts with anti-vaccination content. ‘This is exactly the sort of thing we should be spending our time on and talking about and, if necessary, legislating for,’ Mr Hancock said. ‘As a country we can make decisions on these sorts of things. Anti-vaxxers are a growing problem in the Western world because they try to convince people that vaccinating children is bad for their health. The World Health Organization said they are one of the top 10 threats to human health in 2019, alongside air pollution, a flu pandemic and Ebola. One of the most common myths is that the MMR jab increases the risk of autism, but this has been proved to be a lie. Anti-vaxxers also claim vaccines don’t work and that they may infect children with the illness they try to prevent – both of which are also untrue. If fewer people get vaccinated – and the MMR jab uptake is at a seven-year low in the UK – deadly diseases like mumps, measles and polio could return. ‘Vaccines only work if almost everybody takes them,’ Mr Hancock added. ‘That is the whole point. ‘They are clearly the right thing to do, scientifically. There’s clear guidance from experts and doctors on that. ‘But online there are these pernicious messages being sent to people whether they search for terms about vaccines or not. ‘Sometimes just because they have got the right characteristics – maybe they have small children. The Royal Society for Public Health warned in January that children’s lives are being put at risk by anti-vaccination myths spreading on social media sites like Facebook and Twitter. Half of parents with children under-two reported seeing negative messages about immunisations on social media, a report found. RSPH chief executive, Shirley Cramer said: ‘With the rise of social media, we must guard against the spread of “fake news” about vaccinations. Instagram revealed this month it would block anti-vaxx hashtags in an attempt to stop medical misinformation being shared. Short-term measures will include blocking hashtags including #vaccinescauseautism, #vaccinesarepoison and #vaccinescauseharm, it said. And Facebook – which also owns Instagram – said it would ban adverts with anti-vaccination content on its own website. Facebook also said it will try to limit the reach of groups and pages spreading the misinformation by lowering their ranking in search results and preventing the website from suggesting them in the search bar, The Guardian reported. Vaccines are proven to work and in 1967, the year before the MMR vaccine was introduced in England, there were 460,407 diagnosed cases of measles. In 2017 that figure was 1,693. But the World Health Organization has warned people are becoming complacent about getting the jab. Cases of measles, which usually only causes a fever but can cause pneumonia or the brain infection encephalitis, surged last year. Globally, there was a 50 per cent rise in measles cases last year and more than 900 people died in an outbreak on the African island of Madagascar. ‘This is a wake-up call,’ said Henrietta Fore, executive director of UNICEF. The number of children being given the MMR vaccine in England has fallen for the fourth year in a row, with immunity now at its lowest since 2011. Children are expected to have their first dose before their second birthday but only 91.2 per cent of toddlers in England are meeting this target. The number is down from 92.7 per cent in 2014 – the highest level of the past decade – and from 91.6 per cent in 2017, NHS Digital data revealed in September. England is failing to hit the 95 per cent immunisation rate the World Health Organization recommends to protect the country from contagious infections. Professor Dame Sally Davies, England’s Chief Medical Officer, said last year: ‘Over [the past] 30 years, we have vaccinated millions of children. ‘It is a safe vaccination, we know that, and we’ve saved millions of lives across the world.